Plan your meals around what is on sale in a given week. If you can do this, you will immediately cut your grocery bill by a significant amount. No, you may not always be able to have your favorites, but you will pay much less. Manufacturers have learned that shoppers assume that larger sizes mean better unit prices. This is not always the case. Sometimes the biggest size isn’t the best value, especially if you are using coupons. Check the unit prices listed on the shelf tags, or carry a calculator to figure it out for yourself. Buying in bulk can save money if you will use up all of the product before it goes bad and if the per unit price is better than buying smaller/individual products. You also have to have the restraint to use the bulk item at a reasonable pace instead of using a lot more because it happens to be there. Buying in bulk can be a great way to save money, but you have to be careful of the pitfalls. Most of us eat way too much. Reducing food portions is one of the many things you can reduce to save money. Eating less is simple, but effective. And it’s good for the waistline. Plan your meals ahead of time so you don’t get stuck with nothing to make or no ideas. Lack of planning leads to meals out or trips to the grocery store to buy food when it’s not on sale. The better that you can plan your meals, the more money you are likely to save on your food budget. If your store offers a loyalty card, sign up and use it. Loyalty cards often provide discounts on food and groceries which are only available if you have a loyalty card. The savings with these cards can be quite significant — often double digit percentage savings. Loyalty programs can also be an excellent way to teach kids about money. While fast food can sometimes appear to be inexpensive, the reality is that it’s more expensive than eating at home. There is no doubt that it’s definitely harder on your health. While it may not be quite as convenient to cook your own meals as get them at the dive-through window, it will help your food budget and your health. If you don’t know how, it isn’t hard to learn to cook, and it is well worth the time and effort learning for the savings that you will gain from it. If you love eating out, think about the money you’re spending and whether or not it’s really worth it. The secret that seems to still not have gotten out is that store brands are often produced by the same manufacturers that produce some of the brand names, just with different packaging. Store brands are often cheaper (especially if you don’t use coupons) and it’s difficult to taste any difference in many cases. If you know you’ll be pressed for time during the week, use some free weekend time to make a few meals which you can then freeze and easily reheat so you don’t hit the drive through on busy nights. It’s not for everyone and it’s not always legal, but some people get quite a bit of food by dumpster diving at restaurants and grocery stores. These places throw out unused and unexpired food on a daily basis which some people rescue from the dump and use for their own meals. One of the biggest costs when grocery shopping are impulse purchases. Studies have show that the more time the grocery store can get you to stay, the more you are likely to impulsively spend. Sticking to a shopping list eliminates impulse buys saving both money and time. Bread outlets, farmers markets, butchers, ethnic stores, and ding and dent stores are all sources of less expensive food than traditional grocery stores. The same is true within the store. If you go to the ethnic section within your grocery store, you will often find the same spices for less money than they are selling in the spice section. In-season produce is cheaper than out of season produce that has to be imported. Learning to cook meals that utilize produce that is in season can greatly reduce the cost of your meals during that season. Don’t buy the individual sizes of crackers, cookies and chips unless you score a great deal. Instead, buy a big package and package it yourself in baggies or containers. It’s difficult to know when a deal is really a deal if you don’t know what a good price on a particular product is. A price book allows you to easily track prices at several stores and to know when something is a great deal. Here are some tips for creating a price book. Don’t be fooled into thinking that the computer scanning system can’t make mistakes. The systems do and these mistakes can cost you money. Some stores will even give you the items for free if you catch a pricing error (check your store’s policy if they offer this service). Not only is it good for the environment, there are more and more grocery stores that offer a small discount for doing so. There is a very specific reason that the bakery is at the entrance of most grocery stores. The smell of freshly baked goods helps to make the shoppers in the store hungry and studies show that hungry people purchase more than those that aren’t hungry when they shop. Eat before you shop to cut down on impulse buys. The best way to get in and out of the grocery store is to have a list and to be there alone. Don’t bring the kids or spouse, if possible. They’ll start wanting things and soon you’ll have bought more than you intended. Learn to bring and pay cash when at the grocery store to cut down on impulse buys and the products that just “happen” to end up in your cart. With a credit card, you can pay for those extras. When you only have a set amount of cash on you, you have to stay within budget. Knowing and understanding your grocery store’s policies can help save you quite a bit of money. Is a 10 for $10 only valid if you buy all ten, or is each item sold at a discount? What are the coupon policies? Does your store give rain checks? When you know what the policies are, you can use them in your favor to help reduce your food costs. This is an oldie but goodie which applies just as much today as it ever has. If you pack your own lunch instead of going out or buying from vending machines, you are going to save a lot of money throughout the year. if you never seem to have enough time to make your lunch in the morning, make it the night before. Learn to get your morning coffee fix at home rather than at the local Starbucks. If you can get yourself into the habit of making your own coffee, you can even invest in a really nice coffee maker and still come out ahead. In the same way, bring your own water and carry snacks with you when you leave home. Don’t buy from vending machines, convenience marts, or restaurants. If you have the space, growing your own food is one of the best ways to save money. As a bonus, you control the pesticide use and growing methods. Even if you have limited space, a herb garden can still cut down on your food costs. The big secret about bottled water is most of it comes out of the the same system as the water that comes out of your faucet. If you happen to live in an area where the tap water isn’t good, purchase a filter to run it through. Then pour the filtered water in a reusable bottle to carry with you. Soda is expensive, no matter how you cut it. It can cost $1000 a year. Since it’s not necessary, it’s one of those things you can give up if you need to save money. If you have the space, stockpiling can be a great way to save by buying products when they are on sale. In fact, if you can learn to stockpile and plan your meals from what you have at home (and then buy only the best deals at the store each week to replenish the stockpile), you will have mastered the key to extreme couponing and can reduce your grocery bill by 50% or more even without using coupons. Have meatless meals a few times a week, or make meat a side dish rather than the main course. Meat is expensive and limiting its use can save you money. If you do like meat, consider making it a side dish rather the focal point of the meal so that you don’t need to purchase so much for every meal. 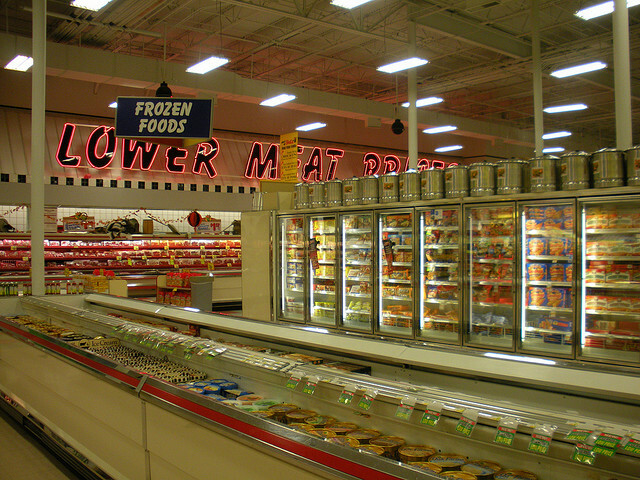 The perimeter of the store is where the basics are usually displayed including breads, fresh meats, dairy, and produce items. This is where you get the most nutritional bang for your buck. Many grocery stores have ding and dent racks, day old bakery items, or a place for dairy items and produce that are about to expire usually at discounts of 50% or more (it’s better for them to get something for these items than nothing at all). If you can use them up before they go bad, these can represent great savings. Your relationship with food has a lot more to do than just money. You have formed eating habits nad these habits are probably costing you more money than they should simply because they are habits. Changing the way you eat and your relationship to food can save you quite a bit of money. If you have the space, buying a chest freezer can be a great investment. Having extra freezer space enables you to build a stockpile of usually expensive food like meat when they are priced at their cheapest. It also gives you the space to conveniently freeze meals for future use. You buy a “share” of the farmer’s crop before the growing season begins. What constitutes a share varies by farmer and crop; it could be a box of fruit or six watermelons. In return for your purchase, you receive your share each week throughout the growing season. Farmers use the advance payments to offset their expenses. This frees you up from having to do the work, but allows you to pick a farmer that will grow the food they way you want. Members of a community come together and use either public land, leased land, or the land of one or more members and grow a garden. In return for your labor and help in tending the garden and helping to buy seeds and supplies, you get to take home some of the harvest. Crock pots can turn out some very tasty, inexpensive meals. You can turn cheaper cuts of meat into stews, or you can throw a hodge-podge of ingredients in there and come out with a great meal. Crock pot cookbooks abound to help you out. The best thing is that you can put all the ingredients in the crock pot before you leave to work and the meal will be waiting for you when you get home. When you do buy meat, learn how to cook the less expensive cuts. These can still be delicious when the meat is made into stews, casseroles, and soups. The above mentioned crock pot can also do amazing things with meats. Opt for canned or frozen fruits and vegetables, especially when these fruits and vegetables are out of season. They’re still healthy, but much cheaper than fresh. Also try canned or frozen meats like chicken, salmon, or tuna for things like casseroles or soups where the flavor and cut isn’t as important. One of the main reasons that a lot of food gets thrown away is because you forget that you have it and it sits there until it goes bad or the expiration date goes by. The clean out the pantry week makes you go through all of the stuff that has been sitting in there. The concept is simple. You don’t buy anything new during this week, and use up the things you already have in your pantry and freezer. Get creative. Some foods are less expensive to buy online. Non-perishables like chips, cereals, baking mixes, cookies, pasta, spices, canned foods, and dried beans can be found online sometimes for less than your local store. You also save the time and cost of going to the store. Some argue that having your groceries delivered is less expensive than going to the grocery store. More and more grocery stores are price matching their competitors. If you have a grocery store that will price match, you can go to a single store to get the best prices on all the food that week instead of wasting time and money going to a number of different grocery stores. If you have the flexibility to shop when you want, choose times when the store will be least crowded to do your shopping. This is usually early in the morning and late in the evening. This will get you in and out of the store more quickly and lessen the likelihood of you making impulse purchases. A special is not always a sale. Grocery stores have learned that customers assume that specials on the end of the aisles are good deals, but that is not always the case (and why it’s important to have a price book). If you can learn to ignore the advertising and look strictly at the price to determine if the product is a good deal, you can save a lot of money. The products that the store earns the most money from will usually be at eye level while less expensive similar products will be on the upper or lower shelves. Stores know than many customers reach for the first product they see that fits their needs and thus place higher priced items where the customer is most likely to see it. By looking around a bit you can save quite a bit while still getting what you need. There are a lot of ways to save on food. Some require a little creativity on your part or a new way of thinking about your shopping habits. Some, like gardening and coupon clipping, require some labor and time. But it’s worth it when you get that food budget down and you have more money for other important parts of your budget. Trader Joe’s might be most famous for its Charles Shaw wine which is often referred to as “two buck Chuck.” It may sound like it might not be the best wine in the world, but give it a try before you turn you nose up to it. It’s actually pretty good and one of the best values on wine you’ll find anywhere. If you drink wine often and you like the $2 Chuck, you can save yourself a small fortune during the year over regularly priced wine. Trader Joe’s is known for their amazing return policy. Apparently they let you return anything, even if it’s already open. Everyone has a tendency to buy a new product they want to try, and half of the time they end up hating it or it sits at the back of the fridge collecting mold. No matter how long it’s been in the back of a cabinet or fridge, Trader Joe’s allows you to return the item for a refund. Trader Joe’s often has buy one, get one free deals going on. You might be surprised by how many people don’t take advantage of these deals because they don’t need two items. However, it’s much cheaper to take advantage of a buy one, get one free deals and just freeze or store the remaining item until you need it at a later date. While Trader Joe’s does not offer any sales or coupons of their own, they will honor any manufacturer’s coupons that you have. So, don’t throw out the coupons your find online or in the Sunday paper. Like many supermarkets, Trader Joe’s has a prepared foods section. This ranges from pre-packaged, store bran frozen meals to the traditional prepared food containers and dishes. While some of these items may look delicious or tempting, they’re far more expensive than they’re worth. That pasta dish going for $6.00 could easily be made for half the price. Trader Joe’s also has a lot of giveaways for their customers, where prizes can range from gift cards to bags of food. Sometimes you can enter giveaways for simple things such as bringing your own bag to carry your groceries home and sometimes your entry fee is spending a specific amount, such as $25. While there’s not always a chance that you’ll win one of Trader Joe’s sweepstakes, it’s a good idea to keep your eyes peeled for any opportunities. After all, who wouldn’t like tow in a gift card that will pay for their next grocery trip? Trader Joe’s may have some very low prices on produce and meat, but that doesn’t mean that the produce and meat available are something you should automatically buy. While many of the canned, frozen, or boxed items at Trader Joe’s are a great deal, the produce and meat sometimes isn’t the freshest (this can vary widely from store to store). The cheapest option isn’t always the best, especially if the meat or produce you buy ends up going bad within a few days. A lot of people subconsciously feel like they have to fill their entire cart full of food before they check out. While Trader Joe’s cheap prices might help convince you to fill your cart to the brink, you should rethink this strategy. It’s best to go into your grocery trip with a set list and stick to that list instead of filling up your cart with whatever looks good. Trader Joe’s has the unique policy of letting you try a lot of items before you buy them. Any employee can open up a container to allow you to test something before you buy it. This is a great way to see if you like something before actually buying it. No one wants to buy something on a whim that they end up hating. If you regularly go to a couple different supermarkets, thinking about keeping a price book so you can write down all the prices for certain popular items and compare them across multiple stores. Sometimes, it’s easy to forget which store has a better deal on certain items, so keeping it all written down somewhere accessible is a great idea. This will help you make sure you’re buying the cheapest option and saving the most money during your grocery trips. You might not think of parking validation as a way to save money at a grocery store, but it’s definitely something to keep in mind. 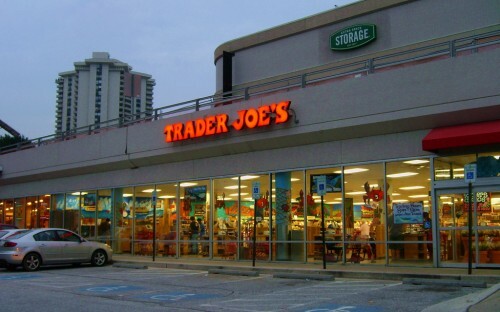 Many Trader Joe’s stores are in city areas where parking is limited. If you visit one of these stores while shopping, there’s a good chance that they will validate your parking, which can save you anywhere between $5 to $30 depending on where you live and how long you’re in the store. This is a nice, extra bonus to shopping at Trader Joe’s and something to take advantage of that other grocery stores in the area may not offer. There are plenty of places online that sell gluten free products, sometimes at a much more inexpensive price than what you would find in a grocery store. There are websites entirely dedicated to grocery items free of gluten, and there are also well-known sites such as Amazon that also have a wide variety of products to choose from. Many deal sites such as Groupon or LivingSocial will occasionally have coupons, discounts, or deals for gluten free products. This could range from a discount for baking ingredients or a coupon for a specific website or store. If you are signed up for deals on these sites, make sure that your preferences are set so that you receive notifications when grocery products are listed as deal. There are coupons for almost everything. A quick internet search for “gluten free coupons” brings up a fairly large list of coupon sites and deals. While some of these coupons may be for specific websites or stores, there’s quite a few that are good for products you’ll find in a local supermarket. It’s worth seeing what coupons you can find for these products if you’re truly interested in saving money on your next grocery trip. A lot of people assume that a diet free from gluten means eating next to nothing. However, food items such as fresh fruits and vegetables, canned or dry beans, rice, or quinoa naturally are free of any gluten. These are items that are almost always on sale and it’s a great idea to load up on these staples to save yourself a few dollars. When shopping for gluten free products, it’s also important that you know the stores that carry what you’re looking for. Some grocery stores may only carry a small selection while others may carry a larger selection. Additionally, don’t rule out going to chain stores or small, independent stores. If you’re looking for certain items, you may have to look in places you wouldn’t normally shop. Knowing where to stop for these products will also help you discover which stores offer the best prices. For instance, the gluten free bread you enjoy may be $2 cheaper at a chain supermarket than it is at a specialty food store. 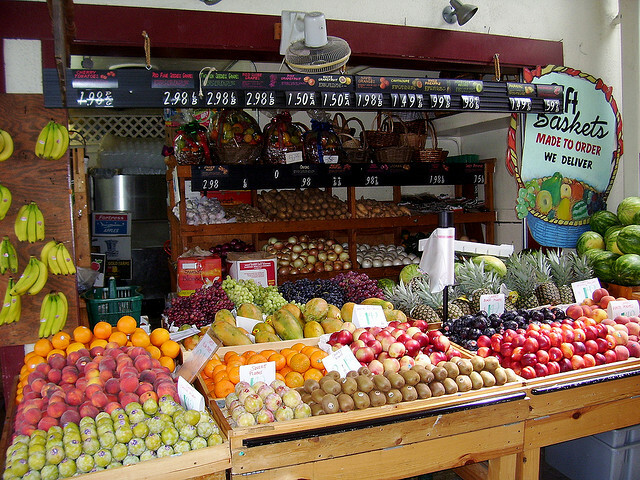 Or a specialty food store may be more willing to take online coupons than a larger supermarket. Shopping around for different prices is definitely a great idea if you’re shopping on a budget. While it might be tempting to buy premade gluten free pie crusts or desserts or other products, you should avoid them if you’re looking to save money. Many of the pre-packaged mixes, entrees, or meals are severely overpriced. Pre-packaged food is overpriced already, but ones marked as containing no gluten are sometimes twice as expensive. If you have the time, make desserts or food items from scratch instead of relying on a mix. There are plenty of websites that have easy directions on how to make gluten free meals or desserts from scratch. If you’re new to buying these products or in a rush, you might not always read the product label closely. In doing so, you may accidentally buy an item that has gluten in it. While this may not seem like a big deal to some people, anyone on a strict budget knows that sometimes even the smallest extra expense makes a difference. Instead of just grabbing cans or boxes off the shelf, take a second to read the product label to ensure that what you’re buying is truly 100% gluten free. 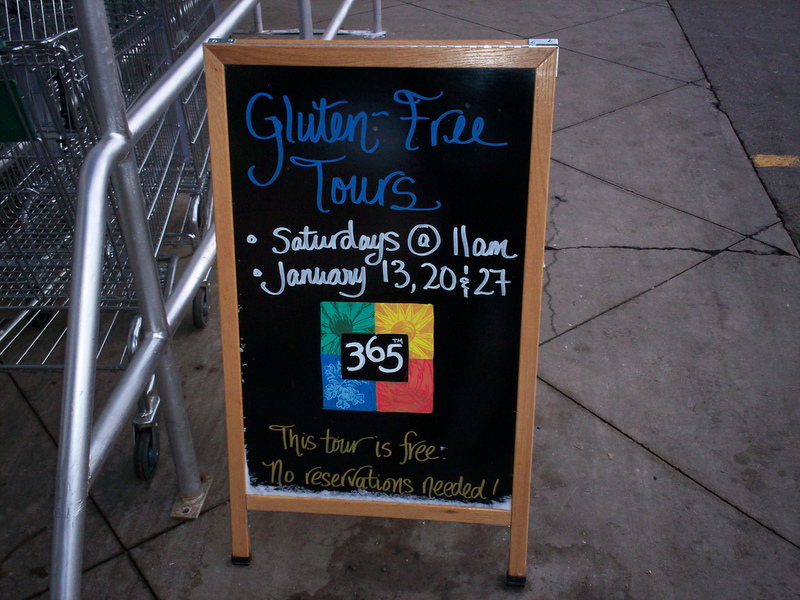 A lot of stores have bulk bins of grains and beans, many of which are gluten free. These bulk bins are often cheaper than buying pre-packed items. However, if you plan on buying from bulk bins you may run the risk of cross-contamination. A lot of people assume that they have to buy special gluten free products instead of cheaper alternatives. For instance, while there is gluten free pasta available you could also substitute it for rice noodles which are a less expensive alternative. Additionally, rice wraps are an easy substitution to bread or sandwich wraps. Instead of grabbing the first special gluten free package in the supermarket, do some research to see what other products are available for a cheaper price.